Two brothers have half of a powerful ancient Chinese talisman. An evil gang leader has the other half and determines to get the brothers' half and have a complete medallion so he can gain absolute power. Back in 1993, Super Mario Bros. became the first movie based on a videogame. While it flopped at the box office, it nonetheless propped the doors to more films of that sort, and these floodgates began to open in 1994. Indeed, the final eight weeks of 1994 brought two movies adapted from arcade “combat games”. Street Fighter grossed $33 million US and showed that a moderate audience would turn out for flicks of this sort. On the other hand, Double Dragon painted a less rosy picture of the cinematic videogame adaptation. In the US, it took in a mere $2 million, a figure that made it a clear bomb. Set in the then-future of 2007, natural disasters and violence fashion the remnants of LA into “New Angeles”, a dystopian location. Brothers Billy (Scott Wolf) and Jimmy (Mark Dacascos) possess half of an ancient Chinese talisman. Wicked millionaire Koga Shuko (Robert Patrick) owns the other half, and he wants the brothers’ segment to reconnect the two parts and use the “Double Dragon” medallion’s magical powers for his own evil ends. This leads to a massive battle over control of the amulet. The existence of this Blu-ray release implies some form of audience for Dragon must be out there. I imagine this consists of people now in their thirties who were kids in 1994 and enjoyed it back then. If we remove the rose-colored nostalgia glasses, I can’t imagine the possibility that actual adults enjoy this film. Amateurish, idiotic and absurd, I find it hard to locate a single positive aspect of Dragon. Granted, I hate to slam a movie that includes the un-ironic use of the line “eat some fist, buttheads”, but Dragon demonstrates such consistent awfulness that it can’t even muster “so bad it’s good” entertainment. Instead, it’s just atrocious to the point of becoming unwatchable. At the age of 51, I’m not the target audience for Dragon, and as a 27-year-old in 1994, I was already too old for it then. Obviously aimed at the pre-teen market, I doubt anyone involved expected adults to flock to it. When you’re a kid, it doesn’t take much to entertain you. Nonetheless, Dragon fails in so many ways that I’d hope even the younger audience circa 1994 rejected it. As hard as I try, I can’t find a single positive element to praise here. The “story” barely exists, as the theoretical plot does little more than shove us from one action scene to another. Characters fail to expand much beyond their sketchy videogame origins, and the actors do little more than ham it up. I’d call Patrick the worst of the bunch, as he devours scenery from start to finish, but all the rest stink so bad that it seems unfair to highlight the Terminator 2 star. I couldn’t locate an estimate of the film’s budget, but I’d guess it cost somewhere between 27 and 43 cents. At least it looks that expensive, as everything about Dragon screams “bargain basement”. With a mix of supernatural bits and fantasy characters, Dragon needs convincing effects to work. Unfortunately, these elements consistently seem ugly and unbelievable, as even by mid-90s standards, the movie feels chintzy and amateurish. If Dragon generated compelling action scenes, I wouldn’t mind these problems so much. Alas, even the film’s bread and butter flops hard. Shouldn’t a movie based on a combat game be able to generate exciting combat? It’s a bad sign when a martial arts movie produces horribly unconvincing action sequences. Blows don’t even remotely connect, as it often looks like the fighters battle from separate zip codes. I get that this kid-oriented movie didn’t want brutal melees, but at least we should be able to believe that punches land. I went into Dragon with low expectations, but somehow it manages to disappoint anyway. A thoroughly horrible attempt to capitalize on a popular videogame, this film couldn’t be worse if it tried. Double Dragon appears in an aspect ratio of approximately 1.78:1 on this Blu-ray Disc. Though not terrible, the transfer suffered from more than a few problems. Print flaws became the most obvious distraction, as various specks and marks cropped up on a persistent basis throughout the movie. Though these could’ve been worse than they were, the flick nonetheless showed far more source defects than I’d expect to see. Sharpness varied. At times, the movie showed pretty good clarity, but more than a few mushy shots occurred as well. At least the image lacked jagged edges or moiré effects. I also saw no edge haloes, and digital noise reduction didn’t seem to turn into an issue. Dragon offered a pretty bright palette, but color reproduction felt inconsistent. While some shots brought out vivid hues, others showed tones that appeared messy and rough. Blacks were reasonably dark and dense, though some inky qualities affected them at times. The same went for low-light shots, as they varied from mostly positive to slightly muddy. Enough of Dragon looked good enough to give us a “C-“ transfer, but it came with far too many problems. It’s 2019 and Dragon fails to include a lossless 5.1 option. Only a Dolby Digital 5.1 track appears here, a reason to immediately deduct points from the release. Even if I ignore that issue, the mix seemed mediocre at best. The soundscape emphasized music and played the score through all five channels in a pretty engaging manner, albeit one that didn’t muster terrific separation. While the music showed up in all the speakers, instrumental differentiation felt average. As for effects, they broadened to the different speakers in a moderately active manner. However, they didn’t bring out great localization, so they blended together in a semi-mushy way at times. While some segments offered positive placement, others were less effective. Audio from 1994 should hold up well compared to newer films, but the quality of the Dragon mix seemed subpar for its era. Speech remained intelligible but the lines tended to show some edginess and lacked particularly natural tones. The synthesizer score lacked great range, so the music was reasonably clear but without much dynamic power. Effects seemed about the same, as they failed to demonstrate much range or impact. Honestly, this sounded more like a track from 1984 than 1994, as it didn’t hold up well. We get a mix of extras here, and we start with a documentary called The Making of Double Dragon. In this one-hour, seven-minute, 35-second program, we hear from producer Don Murphy, writers Michael Davis and Peter Gould, and actors Scott Wolf and Mark Dacascos. “Making” looks at the script and development, story/characters, cast and performances, and reactions to the film. “Making” loses points because it lacks a wide variety of participants, and it also comes with an erratic approach to the film. This means “Making” skips around a fair amount and doesn’t trace the production in a logical manner. Nonetheless, we get some pretty good insights about the movie, mainly from Davis and Gould, as they present lively memories. I’d like a more concise take on Dragon but “Making” still brings a decent overview. Next comes Portrait of a Producer, a 24-minute, one-second piece with Murphy as he discusses Dragon and other aspects of his career. Like “Making”, “Portrait” lacks focus, but Murphy’s thoughts bring us good information. 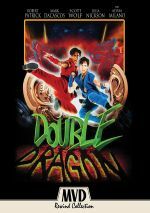 Even before the movie’s creation, Double Dragon hit screens as an animated TV series. The Blu-ray brings us the 1993 pilot episode. Entitled “The Shadow Falls”, this show lasts 22 minutes, 20 seconds. It’s predictably awful but still fun to see as a bonus. Two short featurettes follow. Behind the Scenes lasts four minutes, 21 seconds, while Making of goes for four minutes, 44 seconds. 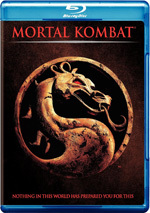 “Scenes” consists solely of footage from the set, whereas “Making” includes comments from Wolf, Dacascos, director James Yukich, and actors Robert Patrick and Alyssa Milano. “Scenes” gives us some good shots, but “Making” offers nothing more than promotional fluff. Five Galleries appear. We find “Stills” (56), “Behind the Scenes” (20), “Artwork” (37), “Storyboards” (59) and “Press Photos” (17). Some decent material arrives, but the DVD-quality presentation becomes a weakness. In addition to a mini-poster, the package completes with a few trailers. For Dragon itself, we locate three trailers and two TV spots. We also get promos for Angel Town, Black Eagle, Man from Earth, Out of Time, Raven and Return of Swamp Thing. A second disc presents a DVD copy of Dragon. It includes the documentary, the featurettes and the pilot but it lacks the other extras. Even by the low standards of the videogame movie genre, Double Dragon flops. Stupid, silly and utterly devoid of entertainment, nothing good comes out here. The Blu-ray provides problematic picture and audio along with a generally good roster of supplements. As both a film and a Blu-ray, this release sputters.